Clicking down the dingy alley are a pair of patent leather stilettos at the ends of a shapely set of pale legs. They quickly make their way over the grime slicked asphalt. Blood coats the toe of one shoe. The thick stinking gel leaves little crescent moon impressions on her path. A shadow moves in the gloom ahead. Fingers missing nails, dig exposed bone into the pile of trash. Thick brown pus oozes out as it struggles to drag the connecting half of a body forward. A low moan issues from the rotting corpse, it’s half chewed tongue lolling out over broken teeth. With a jerking push it spills into the alley and lifts itself up on shaking arms. The effort forces putrid black intestines to slip from the gaping end of its torso. The corpse’s focus is solely on the owner of the clicking heels. The heels which haven’t missed a beat. The corpse lifts it face to her like a flower to the sun. Dead grey eyes wide and nostrils flaring at the scent of living flesh. The heels pause, one lifts up and plunges down into the creature’s eye. Thick milky fluid bursts up onto the heel and the corpse shudders as a thin line of clotted blood forces its way out through ragged lips. 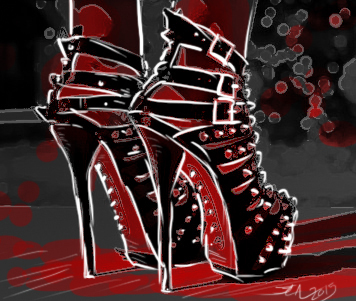 With a snarl the woman shakes her heel free of the, now inanimate, meat and continues clicking onward.